Does AJAX Refrigeration recommend preventive maintenance? How about, does AJAX Refrigeration suggest using a water filter for your ice machine? Why preventive maintenance and the use of a water filter? How about a little story for a change of pace and fun? …there were two ice machine brothers that were born from their factory as identical twins and ended up living right next door to each other in restaurants on Main Street USA. During their installations their new owners had a choice of whether to install a water filter for their new ice machines or not. Owner A decided to invest in a proven water filter system that was recommended by their contractor Mr. Penguin, and he also committed to a quarterly preventive maintenance plan. Owner B decided he did not want to invest any more money into his ice equipment as the purchase price was pretty high and he didn’t want to spend anymore money. He figured since his machine was new it didn’t need a filter and maintenance: “that’s for older machines that need extra protection,” is what he told his partner. The ice machine that had the filter installed noticed right away that the water he processed into ice smelled good and ran smoothly through his water system. That made him happy. The second ice machine that didn’t get the filter noticed something strange about the water flowing through his pipes. It kinda of had a strange smell and was felt rough. That made him sad and it took him a long time to make a batch of ice that never quite came out just right. After a year of making ice the first ice machine was feeling good and was proud of his crystal clear ice and he heard about how happy the clients were with their beverages! Not so with Owner B’s ice machine. This machine was feeling sad and sick. The ice he made smelled bad and he heard that the clients complained about the funky taste in the ice. He also was having a really hard time making the ice and felt all clogged up and could barely run water through the water tubes and pipes in his once shiny new system. He also had a hard time breathing and felt like he had a fever as he always ran so darn hot. Poor friends in the kitchen, they never liked it when he blew hot air into that already hot space! Not long after that this sad little ice machine decided he had enough and had grown too tired of making ice for Owner B. He liked Owner B and wanted to do his job but just couldn’t hold on any longer and had to stop working. The little ice machine next door at owner A’s was very concerned about his brother and why his identical twin was doing so poorly already! He was feeling great as he not only had a great water filtration system, owner A also decided to purchase a quarterly PM plan to keep him healthy. That naturally allowed him to produce as much ice as his data plate indicated for the lowest cost in terms of energy and he did it without hardly having to breathe out any of that hot air that the kitchen staff so dreaded. When the AJAX Refrigeration repairman was called out to help the little ice machine at Owner B’s he noted that although the unit was relatively new and still under warranty the unit had stopped working because of maintenance issues; namely the water system was plugged up and there was no way the little ice machine could make ice because no water could flow through the pipes. The coil that allows the machine to breathe nice cool air was so plugged up that the machine was suffocating, he couldn’t even breathe! The AJAX repairman noted that the cleaning of the unit would take some hours and would not be covered by the manufacturer’s warranty because it was a maintenance related failure. He suggested a water filtration system to prevent such failures from occurring in the future along with a quarterly preventive maintenance plan. He noted that the exact same machine next door was doing great and had absolutely no problems! Owner B confirmed this with Owner A and he had a chance to see how happy ice machine #1 was. He was blown away that a water filter and a little TLC could make such a difference! There was that happy ice machine, just blowing cool air out it’s vents, nice and quiet while making the nicest clear, freshest tasting ice ever. It almost looked like that ice machine was smiling! He also noticed the Penguin sticker on the front panel that indicated AJAX Refrigeration was taking care of this equipment through their quarterly preventive maintenance program. He also remembered hearing about AJAX’s great full service ice machine leasing program that would allow owners and managers just like him to focus on his business, not his ice machine AND he could have a happy ice machine just like the one at Owner A’s! He decided to sign up for a quarterly maintenance and purchase a good water filter system from AJAX that very same day. He also recommended AJAX’s full service ice machine leasing and sales plans to all his friends. Next time he ever needed a new ice machine or a second unit he would lease it from Ajax Refrigeration! Those two identical ice machines were then back on track and singing in harmony! They were making the best ice for the lowest cost per day and they all lived happily ever after! AJAX Refrigeration can help you own or lease a happy ice machine too. Don’t go through what Owner B went through, save yourself the time, money and the heartache! 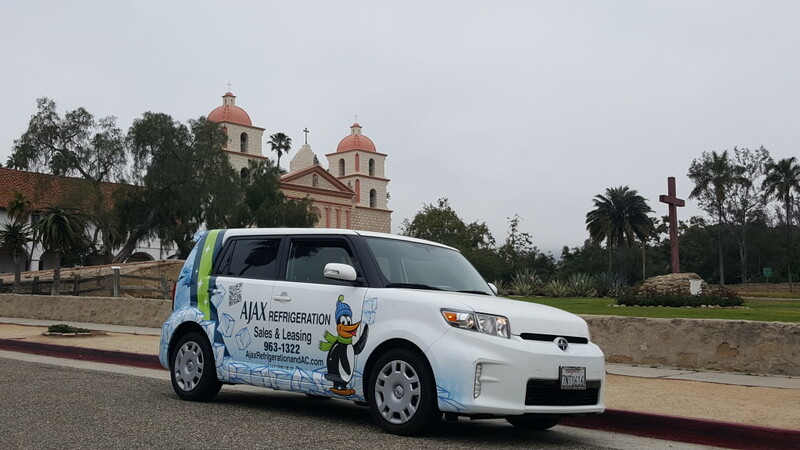 Water filtration systems, the most comprehensive full service ice machine leasing program and the best sales options in Santa Barbara and Ventura Counties: that’s what the AJAX team will bring to you! 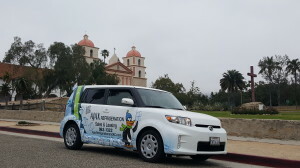 Serving Ventura and Santa Barbara Counties since 1949!